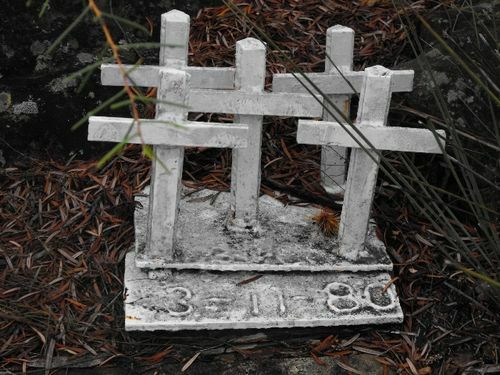 Memorial consisting of five crosses commemorates members of the Sutherland Shire Volunteer Bushire Organisation who were tragically killed on the 3rd November 1980. In 1980 five members of the Sutherland Shire Volunteer Bushfire Organisation, Station 10, Headquarters Brigade, were killed when their truck was caught in a burn over the Uloola track near Waterfall. They were Steve Crunkhorn, 26; Gregory Rolf, 24; Vernon Stedman, 21; David Marshall, 19; and William Cummings, 21.